Toys! 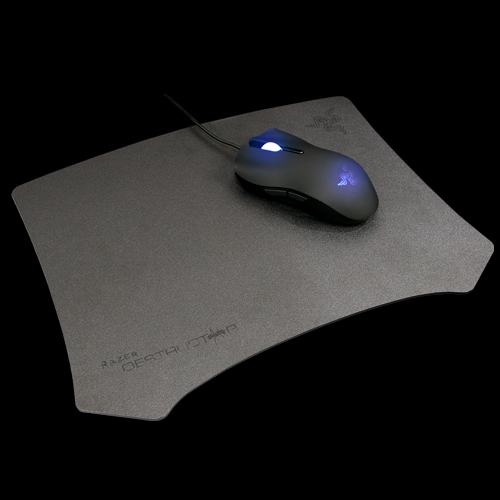 Razer Destructor Mousepad… | Fruit for Thought! It’s a fantastic mousepad, that’s for sure. And not much more. It doesn’t make me breakfast, and it doesn’t have the meaning of life written on the back. Cost me $50, but the plain table surface I was using before was kinda getting on my nerves; my mouse (Logitech MX518) never really travelled well across it. Grabbed a wireless card for my old to-be Linux box, though it’s not showing any display. Perhaps the Radeon 9500 Pro I subjected to so much abuse in it’s time has finally taken it’s toll, and its finally gone and died. That would probably explain why the TV-out was a no-go as well. 50 bucks! That’s like 2 movies with candy, or a long time at timezone, or 25 red eyes, or 41% of my mouse, or 14% of a good graphics card. so let me get this straight, all in all.. it’s just a mousepad? ooh btw, my plain table surface is reallllllly good. and so is my, uh..’Microsoft Wireless Optical mouse 2.0A’!! I checked the back, it’s got Kate Moss stuck onto it.